CAUTION: This is all pure speculation - just a theory. We are clearly in the season, but no man knows the exact day or hour. The basic premise is that the Rabbinical September 13th date clearly fell in the summer while the final three festivals should all occur in the actual harvest season (after the autumnal equinox). The theory goes that an intercalary month should be inserted somewhere to make this happen. This being the case, Feast of Trumpets would occur in Israel from sundown October 14th to sundown October 15th (beginning midmorning on the 14th in the United States). There is much confusion today in regards to the Biblical calendar because much has been lost about how to interpret certain scriptures. For example, does a month start on an astronomical/technical new moon (traditional Rabbinical calendar) or on the first sighting of the new moon by two reliable witnesses (Karaite calendar)? Even among Karaites there exists division between those who say the calendar is universally based on the first sighting of the new moon in Jerusalem and those who say that months start based on the first sighting of the new moon regionally. Additional confusion exists in the fact that not only did God command the Israelites to observe a lunar calendar, but He also commanded them to correlate this to observable harvest signals in the land. In Biblical times this correlation kept the calendar in sync with the seasons. Over the past several months I've read way too many arguments for 'this' or 'that' Biblical calendar interpretation and my take away from all of this is we probably won't know for sure until Christ comes. Much knowledge was lost when Jerusalem was destroyed in 70 AD. 1. Wednesday, October 14th to Thursday, October 15th, is a possible date for the Feast of Trumpets. 2. If the Hillel calendar is not ahead by 30 days as proposed above, then this makes the date still interesting because it is the first day of the eighth month of Cheshvan and it has been widely observed in prophecy circles that eight represents completion and grace. Also, Colossians 2:16-17 indicates that festivals, new moons, and sabbaths are shadows of things to come. 3. Many have speculated on why the first 69 weeks of years in Daniel's prophecy are purposefully divided into '62' and '7' - each beginning from "the decree to restore and rebuild Jerusalem". It seems at the very least possible that this was because there would be two future fulfillments: one in the time of Nehemiah and one beginning after Israel captured Jerusalem the second time in 1967. Interestingly, everyone begins the second count from June 7th, 1967 during the Six-Day War, yet there is no known record of a decree being made that day. But... the actual decree of Israel's annexation of Jerusalem (restoring Jerusalem to its rightful owner) and the implementation of that decree unquestionably occurred on June 27th and 28th in 1967 (see here, here, and here). 49 prophetic years later brings you to October 14th, 2015. 4. November 2nd, 4th, and 11th of this year have all been suggested dates for the actual beginning of Daniel's 70th Week (the 7-year tribulation) because they would allow Christ's Second Coming on Rosh Hashanah or Yom Kippur in 2022, respectively. If it's the 4th then an interesting pattern emerges: potential rapture on October 14th and tribulation beginning on November 4th. This may explain why all the '4s' during the third blood moon on 4/4/15. There also would be exactly 7+7+7 days from Yom Kippur (9/23) to October 14th and 7+7+7 days from October 14th to the beginning of the tribulation. 1. The baby is missing from her womb. I imagine many pregnant women will have missing babies in utero when the rapture occurs. 2. 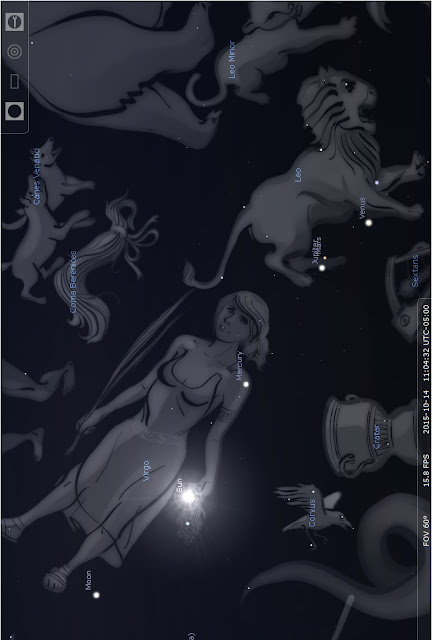 And Mercury, the planet associated with Michael the Archangel is right at her shoulder: 1 Thessalonians 4:16. 3. Also of interest, although not visible in the above picture, Saturn, the planet associated with satan, awaits directly below her near the constellation Libra. It is enough to make me a little more watchful than usual. Kind of funny that the premiere of HBO's rapture series "The Leftovers" occurred one year ago on October 14, 2014.